Categories: Scriptures, Srimad Bhagavata Saptaham, Srimad Bhagavatam. 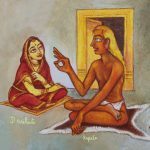 Sage Shuka was the son of Sage Veda Vyasa, and the narrator of the Bhagavata Purana. Sage Shuka was a garbha-shriman – one who was born a self-realized soul. The parrot agreed and started searching for Hari katha (stories of Lord Hari). When he was looking around, he found Shiva telling Parvati the sacred Bhagavata Purana. He hid behind the leaves and started listening to the Bhagavata Purana. Before beginning the story, Lord Shiva had told Parvati to keep saying ‘yes-yes’ so that Shiva would know that she was paying attention. But Parvati fell asleep. The parrot didn’t want to stop listening to the katha, so it started saying ‘yes-yes’. After a while, Shiva noticed that Parvati had fallen asleep and started looking for the person who was saying ‘yes-yes’. He found the parrot and started chasing it. 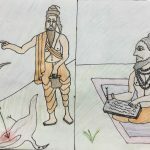 At this time, Sage Veda Vyasa’s wife was yawning and the parrot flew straight into her mouth and into her stomach. There it transformed into a human being. The baby stayed in the mother’s womb for 16 years as it did not want to be born. Sage Vyasa’s wife prayed to Krishna for liberation from this problem. Finally, after Krishna promised the baby that he will remain untouched by the Lord’s Maya, the child came out reluctantly. The moment he was born, he left home and went away. His father went behind him calling, “Putra, Putra (son)…”, but he never looked back. All the trees and animals started answering instead of him, proving that he was one with the nature. Sage Veda Vyasa searched for him for days and nights, but still could not find him. Finally one day, Sage Vyasa’s disciples were going to the forest to pick a few fruits and flowers for their worship to Lord Vishnu. Sage Vyasa had told his students to keep chanting a sloka (verse) from the Bhagavata Purana. The sloka was “barhapIDam naTavaravapuhu karNayoh karNikAram, bibhradvAsaha kanakakapisham vaijayantIm cha mAlAm…”, that describes the beautiful form of Lord Sri Krishna. The moment Sage Shuka heard this from the disciples, he was attracted and asked them to chant many more slokas like these. They told Sage Shuka that, if he came to their Guru, Sage Vyasa he would recite 17,999 more slokas like this to him. That day, Sage Shuka finally went back home and learned the whole Bhagavata Purana from his father. 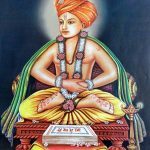 Later, he recited the Srimad Bhagavata Purana to King Parikshith, who was very eager to listen and had only 7 days of his life left. He explained Krishna’s leelas, the Creation of this world, Dharma, stories of bhagavatas (devotees), and many such wonderful leelas of the Lord to Parikshith and many other rishis who had assembled there. 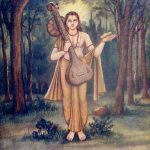 After hearing Srimad Bhagavata Purana from Sage Shuka for seven days, Parikshith attained liberation. 4 Responses to "Sage Shuka"
Wonderful narration Prathamesh!! Keep up the good work. Radhe Radhe!! Prathamesh! wonderfully narrated. I loved the line ‘They told Sage Shuka that, if he came to their Guru, Sage Vyasa he would recite 17,999 more slokas like this to him.’! !